As you’ve no doubt noticed I’m writing three weeks later — I took my Fourth of July day off on Friday and headed down I-40 to the Craggies, where I was hoping a day of abundant sunshine and jagged stone would yield a harvest of photo ops. 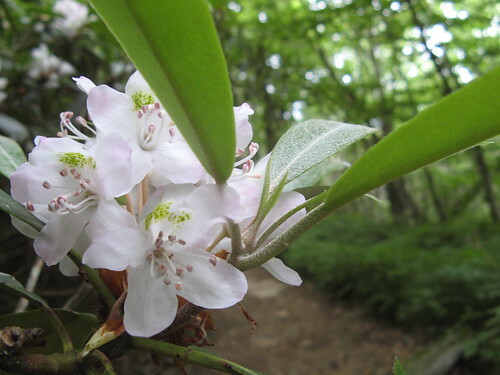 I left mostly disappointed: no blue sky, not many crags, and the annoying realization that it’s not called “Craggy Gardens” because of the crags, but because the rhodo bloom creates a high-country flower garden. I went to bed last night convinced there’s no earthly reason to hike here outside the bloom season. This morning I trudged to the computer with the idea of throwing something on the blog to get it out of the way and get back to enjoying my three-day weekend. Then I looked at my pictures again. Turns out there’s a lot going on in the Craggies that you’ll never notice while the Big Bloom is hogging the spotlight. And the bonus: no swarms of rhodo gawkers (presumably the area gets pretty crowded on peak-season weekends, since it’s so close to Asheville). Just so I’m not overselling it: the hikes with the best scenery are pretty short; not flat enough to be called “easy” but not challenging by any stretch. I added two miles on the Mountains-to-Sea Trail to notch a five-miler. 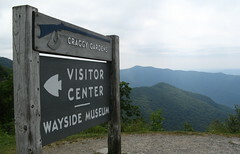 Craggy Pinnacle is a parking area just north of the Craggy Pinnacle Tunnel on the Parkway. The hike starts out in a rhodo tunnel that must be quite impressive during the bloom. The trail is pretty rocky but not super steep. 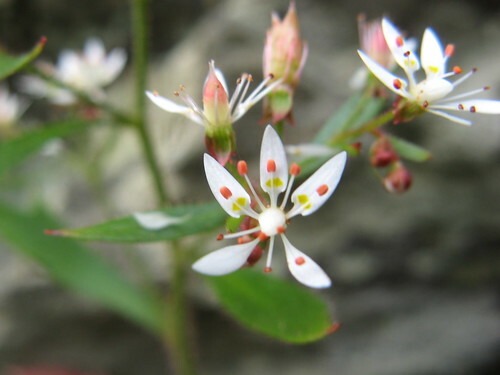 Can anybody ID this wildflower? 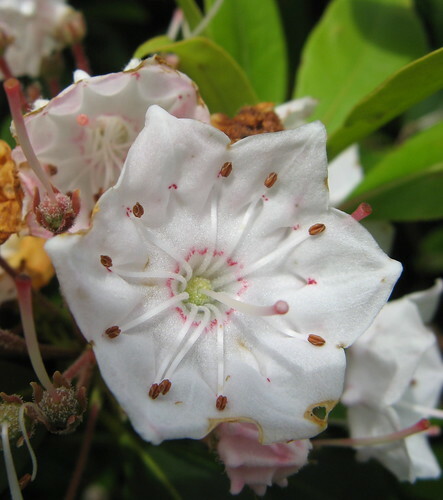 Mountain Laurel, as we all know. 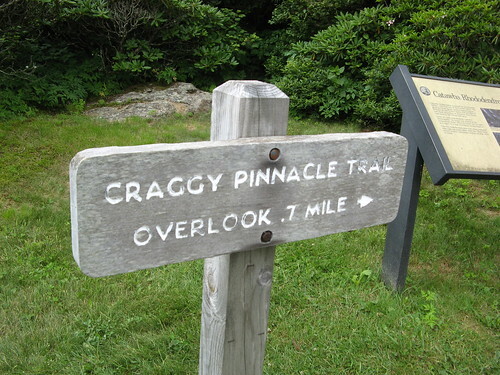 The trail to the overlook at Craggy Pinnacle splits in two parts, with spectacular views at both ends on clear days. I had to make do with overcast. SmokyScout has been helping me identify the mountain flora. 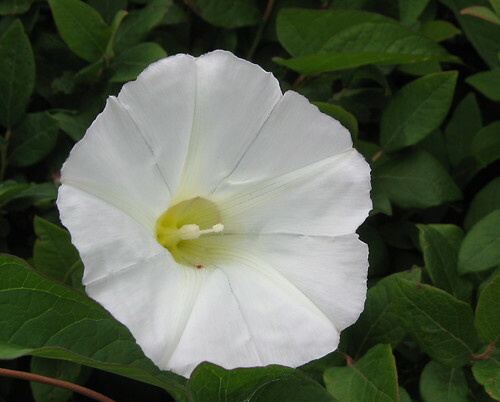 This is a morning glory. 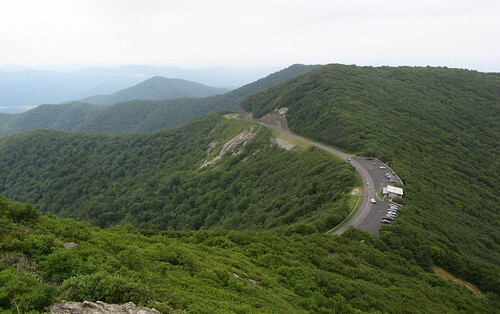 Looking south over the Parkway and the Visitors Center. 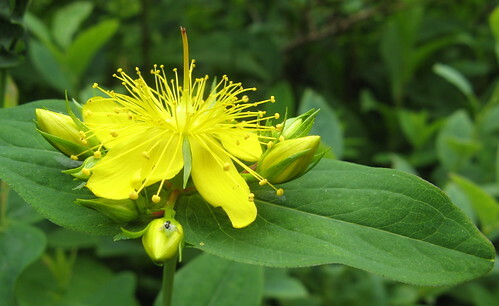 Another St. John’s Wort sighting (last seen at Grandfather Mountain last week). 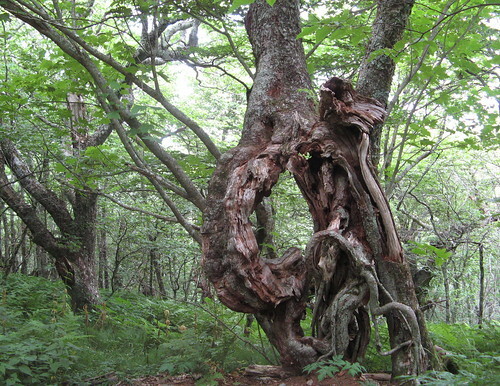 Another excellent feature of the Craggies: Trees bent in very strange configurations. 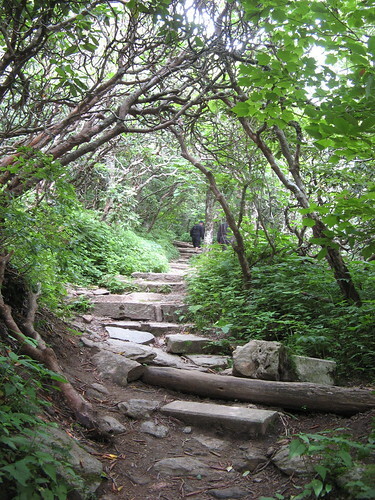 OK, on to Craggy Gardens and the (you guessed it) Craggy Gardens Trail, which climbs rather steeply for .8 mile to a hiker shelter and a “bald” — a large treeless summit. More on the bald is coming up. 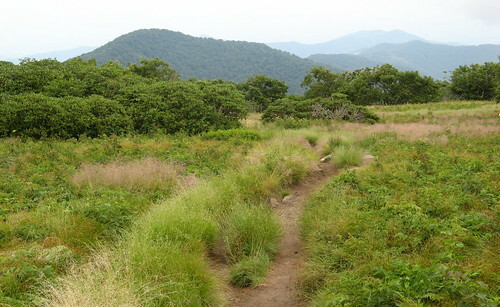 Craggy Gardens Trail, which is a segment of the MST, starts at the north end of the picnic area. There’s a split in the trail after a very short walk; I went right, which seemed to be the right way. 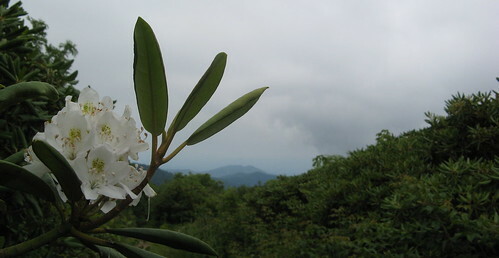 A few white rhododendrons remain. See, even more wacky trees. SmokyScout suspects this is a morning glory. Do I hear a second? 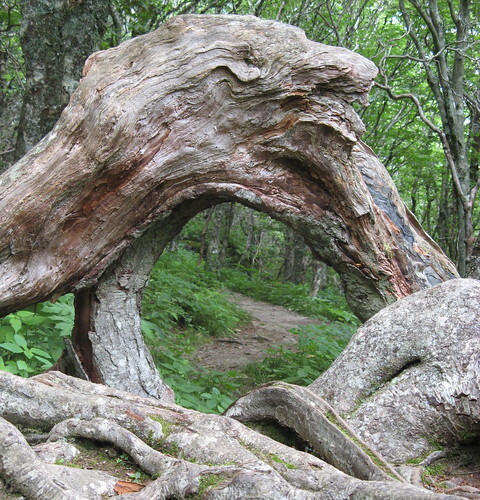 Another scene from the Craggy Gardens Trail. 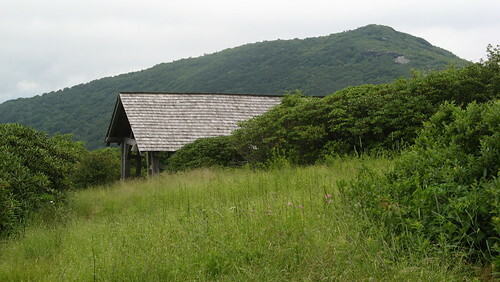 This is the shelter — a spur trail explores the nearby “heath bald,” which from the air must look like somebody came through with a lawnmower with the adjustment set too low. View from the bald. Not bad even on a cloudy day. 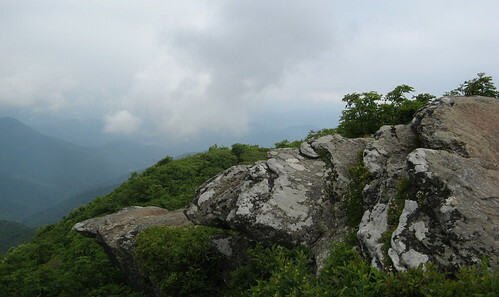 After wandering around the bald, I hiked the rest of the Craggy Gardens Trail, which ends at an intersection with the Douglas Falls Trail; I hiked about a mile of it one-way, then returned. This section of trail is underwhelming — all tree tunnel, few cool rock formations, lots of dicey footwork, and you can hear people and their Hogs at the visitors center for the first half-mile (every year I become 1.6% less patient with people who thunder through spectacular settings on Harleys; heard ’em at Yosemite, hear ’em along the Parkway. When are they going to grow up and install mufflers?). Romantic Asheville’s Craggy Gardens Page. I think the purple flower that Smoky Scout suspects is a morning glory is actually a variety of phlox. 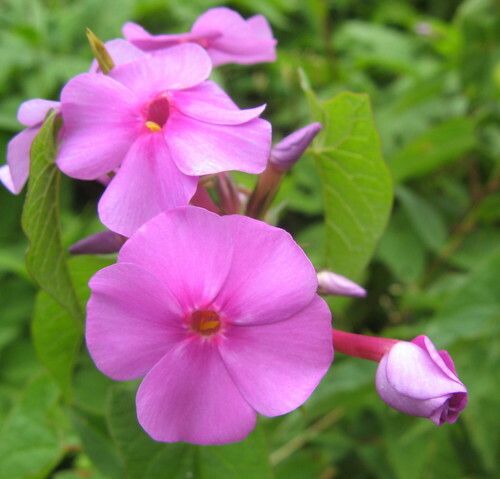 Could be … the other pictures I took nearby looked more like the pictures of wild phlox I found online. Tom – looks like a really interesting place, all in all – can never sell Mother Nature short, wherever you are! Have you ever been to Hawksbill??? If you are looking for craggy views, this is the one to come to. It’s in Jonas Ridge, about 45 minutes south of Boone, 15 minutes south of Linville. 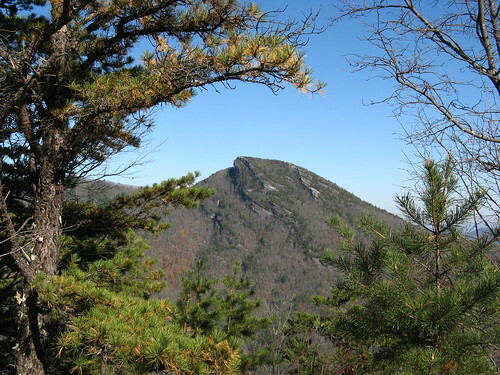 You can see: Linville Gorge, Table Rock, Grandfather Mountain, Sugar Mountain, Beech Mountain, and long-range valley views. 360 Degree View @ Summit. Pretty Amazing. Charles: Haven’t been to Hawksbill but it’s on the to-do list. I do have a picture of it though.